Recognizing that sustainable consumption is an important policy goal, encompassing the environmental, social and economic consequences of daily life decisions, Germany has adopted a National Programme for Sustainable Consumption.The Programme covers six thematic fields (mobility, nutrition, home and living, work and office, clothing, tourism) through instruments such as consumer information (including labels), education and eco-design. 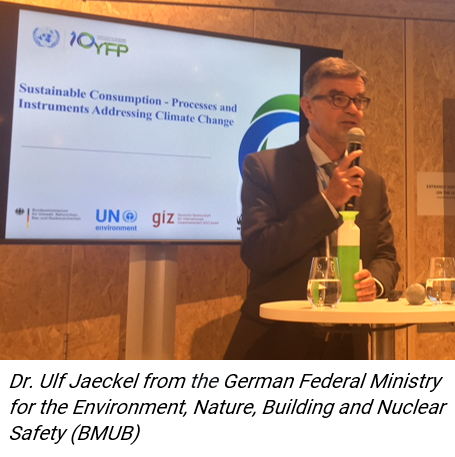 Germany is also supporting efforts at the international level, including through its International Climate Initiative (IKI) and its active involvement in the 10 Year Framework of Programmes on Sustainable Consumption and Production (10YFP). The latter is committed to developing SCP tools whilst building synergies and uniting institutions for joint work. 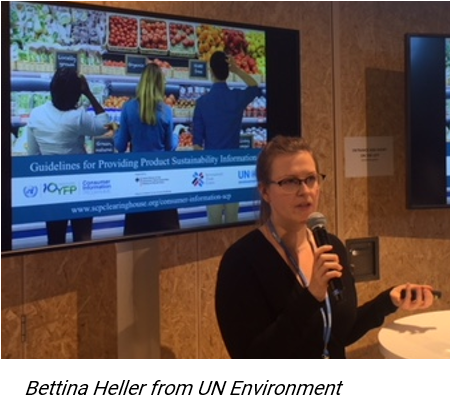 One such example are the recently launched 'Guidelines for Providing Product Sustainability Information’, created with inputs from over 125 organizations, in response to calls for international agreement and guidance on how to convey information on products’ sustainability attributes and performance to consumers. 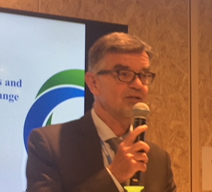 UN Environment and the International Trade Centre led this work that aims to inspire information providers to build upon the valuable efforts already underway, in line with SDG Target 12.8. It is currently undergoing a road testing phase. Advance SCP activity in Morocco coupling Sustainable Tourism and Eco-labelling: The environmental footprint is based on a methodology previously tested in France and is provided by Betterfly Tourism. It indicates the average of 10 Moroccan hotels’ impact on climate change (kg CO2 / person per night), water consumption, non-renewable resources consumption, and percentage of products that are certified organic. GIZ shared experiences from South East Asia to address climate change through Eco-labelling and Green Public Procurement (GPP). 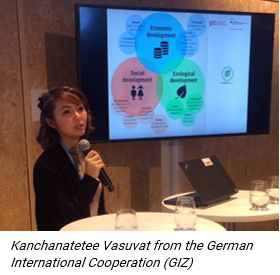 Kanchanatetee Vasuvat presented results from a project which sought to reduce GHG emissions through the integration of climate friendly criteria in GPP and successfully reduced 113,000 tonnes of CO2 as a result. This work is continued under the current IKI project Advance SCP in Thailand, Indonesia, Malaysia and the Philippines. Through the project, the four countries are also developing Nationally Appropriate Mitigation Actions (NAMAs) and supporting the creation of new markets for climate-friendly products. Martina Fleckenstein from WWF Germany concluded the event with a presentation on the IKI project Establish Low Carbon Consumption and Production in Southeast Asia. The project supports governments, business and consumers to reduce GHG emissions in the agriculture and food sector. 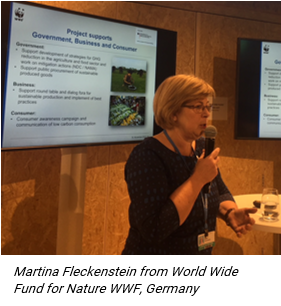 Martina highlighted the unique opportunity to explore the link between the SDGs and the Paris agreement, stating that “NDCs can become a powerful tool to develop climate mitigation actions in the food sector, to shift to sustainable consumption patterns.” Support and action in this area is needed: while 90% of the 169 submitted National Determined Contributions (NDCs) mention agriculture, forest or land-related issues, only 6% of NAMAs are for agriculture as of date. The organizations will continue to work in this area and foster partnership to drive sustainable consumption to address climate change, through IKI projects and the 10YFP. The International Climate Initiative of the Federal Ministry for the Environment, Nature Conservation, Building and Nuclear Safety (BMUB) has been financing climate and biodiversity projects in developing and newly industrialising countries, as well as in countries in transition since 2008. The German Federal Ministry for the Environment, Nature Conservation, Building and Nuclear Safety (BMUB) has been a part of the German Federal Government since 1986. The German International Cooperation is a competent service provider who develops tailor-made solutions to challenging problems. Supporting governments and international organisation’s to achieve their objectives. The World Wide Fund for Nature has been working to protect the world’s species and natural places, pushing for a more sustainable world, working with a variety of stakeholders to define new ways of functioning to make a difference and help redefine humanity’s relationship with the planet.